The following guest blog has been provided by our friends at Quertle. Like Trip, Quertle is a small independent organization. To help us both thrive and stay independent we are exploring ways to support each other and highlighting each other’s products seems like a nice first step! So, on with the guest blog…. When you need to find evidence-based information, you know Trip is the tool of choice. But, there are many times when you need broader information. Like most people, you probably have been frustrated by PubMed, Google Scholar, and even the expensive paid search engines. That is because traditional search engines work to find anything that might possibly be relevant, leaving it to you to weed through long lists of results to find what you need. How many times have you looked past page 1 or 2 of the results? Instead you start narrowing down your search to get more relevant results. As a consequence, more often than not, you end up eliminating some of the most critical documents you were looking for. In fact, up to 30% of R&D budgets are wasted on rediscovering existing information. Interested? Try Quetzal or contact Quertle for more information. Quetzal is available via subscription, or as a custom deployment within your organization. And, for being a fan of Trip, please use Coupon Code 6Cwy4ZW&c-3-1 when you register for Quetzal Advanced (monthly subscription) to receive one free month of access. I was looking at a post from Cochrane Canada on Facebook relating to a free answer they’re making available from the Cochrane Clinical Answers. 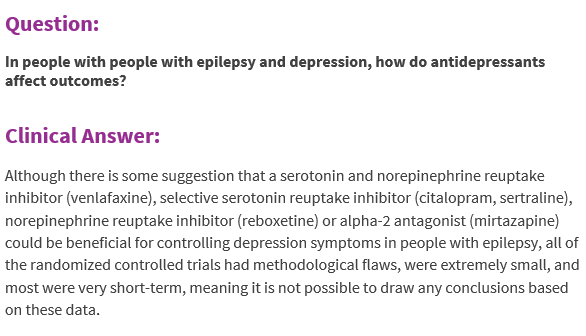 The question they were supplying an answer to was “In people with people with epilepsy and depression, how do antidepressants affect outcomes?”. Call me biased but our answer appears pretty good. A massive advantage of our system is that it’ll always be as up to date as the published literature (it generates answers from the literature in Trip) and will answer loads more questions than any other resource – when we launch we’ll probably be able to answer 100,000+ questions. I have revisited the idea many times in the last five years, always trying to solve the same problem: a search engine doesn’t answer questions, it gives you 10-20 results to articles that may answer your question. I borrowed the term ‘answer engine’ from Steve Wozniak (co-founder of Apple) who used it in relation to the release of Siri. He said people want and need an answer engine. From a set of search terms can you infer the likely question? Can we find an answer to that likely question? Given there will be potentially multiple answers in Trip, can we surface the best answer? So virtually a 50% success rate, which impressed me! But the biggest reason for the partial passes is our system not pulling through the answer (a relatively simple fix) and the biggest reasons for the failures was the inability to exclude additional terms which confused the answer (again, this should be a relatively simple fix). It can integrate seamlessly with the existing Trip interface but also act as a standalone product/app! It can easily be integrated with our multi-lingual systems to users will be able to search and obtain answers in languages such as French, German and soon to come languages such as Spanish. No English will be needed! It will always be as up to date as the answer are based on all the evidence in Trip. It is modular and will launch with a focus on therapeutics. It will then expand to include medicines information (eg side-effects, interactions, contraindications) and from their I’d like to tackle clinical guidelines or lab tests (depends on the resource availability). A user can get an answer in less than 5 seconds, when previously they would have had to scan the first 10-20 results to see which result was most likely to answer their question. Assuming they get the best article they still need to read/scan it for the answer. So, considerably longer. This is brilliant, it really is…!